Jupiter transit to Libra 2017 prediction for Sagittarius Sign - Guru peyarchi palangal 2017 for Dhanu Rasi as per Thirukanitha Panchangam. Let us analyze Guru Peyarchi 2017 prediction in detail for Dhanu Rasi, so we can know what to expect. The Sagittarius is the 9th house in the Zodiac chart, according to the ancient Vedic astrology. The stars or Nakshatras Moolam, Pooradam and Uthiradam (pada 1) come under this constellation. The people born under any of these stars will have Sagittarius as their moons sign. Your words as shift and sharp as arrows will vanquish your enemies, while your quick wit and intelligence will see you through tough situations and bring in victory for you. Lord Jupiter is the ruler of your sign. As Lord Jupiter is your ruler and looks after your health House, He brings you welcome changes to your life. Last year, Lord Jupiter transited to the House of Virgo on August 2, 2016 and is currently placed here. This year, Lord Jupiter will transit to the House of Libra on September 2, 2017 and stay there till October 4, 2018. Last year was full of problems for you, leaving you feeling miserable and tired. Students were unable to perform well at their studies. Some failed, lost their seats and some had to change colleges or schools. Those in business and jobs were affected greatly. Some lost their positions, jobs or even businesses and change of location due to their jobs. Some could not attend to their work due to poor health. Problems abounded in your family life too. Thus this year’s transit will be a welcome change for you. Lord Jupiter will transit from the House of Virgo to the House of Libra on September 2, 2017. This year’s Guru peyarchi 2017 brings in good outcomes for Makara Rasi. Lord Jupiter transits to your House of Profit, thereby ushering in good luck and welcome changes to your life. This will free you slightly from the heavy problems faced under Lord Saturn for the past three years. Lord Jupiter aspects your 3rd House (House of Aquarius) with His 5th part gaze. The 3rd House deals with your courage and your younger siblings. You will succeed in whatever you undertake. Your younger siblings will have a great year ahead. 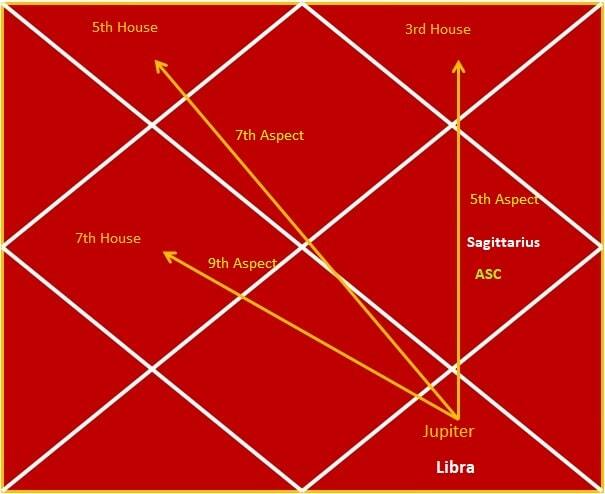 Lord Jupiter aspects your 5th House (House of Aries) with His 7th part gaze. This House deals with your children. Your children will do well in their academics, chosen profession, marriage and children. Lord Jupiter aspects your 7th House (House of Gemini) with His 9th part gaze. The 7th House deals with marital relationships. Your marital relationship will grow stronger. Those who had been living separately will start living together. Childless couples will now have occasion to rejoice. Those awaiting their marriage will get married. Students will perform well at academics. Your business will become stronger. Work prospects for Capricorn sign will be good, with increments and promotion. Marital discord will vanish. Marriages will take place and children will be born to childless couples. Your debts will start to clear away. You will receive your outstanding dues. Court cases will run in your favour. Generally speaking, Lord Jupiter saves you slightly from the grips of Lord Saturn.